This feature is in two parts. There is a link to part II at the bottom of the page. The spectacular photograph above (© Turi Caggegi) shows the most recent major eruption in 2013. 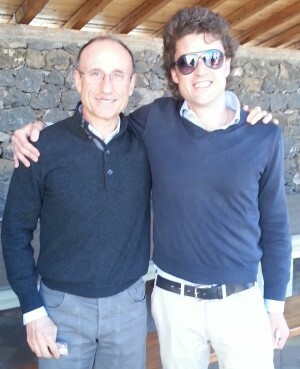 In fact, it is Etna that makes the wines of this region so special and so intriguing. It has an enormous influence, with a circumference of 140 kilometres it dominates wherever you travel in the region. On my May visit the ginestra – the yellow flowered ‘broom’ – and wild poppies were everywhere, carpeting the ground in vivid burst of Day-Glo colour. The volcanic soils are rich and fertile, with a top layer of decomposed lava and volcanic sand. The best vineyards are sited at 600 to 1100 metres on its slopes – in those places not piled high with huge mounds of lava from a recent very major eruption in 1981 (though Etna is almost constantly erupting: as recently as July 2011 the main centre for Etna tours was only saved from destruction by emergency action to divert a huge new lava flow). Though vines have been grown on the island for centuries, it is only since 1968 that Sicily has had any DOC wines, with DOC Etna being its first, followed soon after by DOC Marsala from the west of the island. Historically, many producers will tell you that the rich red wines of Etna that were not drunk locally journeyed hundreds of miles north, to add some oomph to the weedier wines of old-style Bordeaux and other regions of northern Europe. Etna lies in the northeast of the island, the nearest large city being Catania, which has a broad range of international direct flights. Vineyards are sited on the eastern slopes of the Volcano generally, to the northeast and southeast, though the vast majority of wineries are clustered in the northern zone around the town of Passopisciaro. The climate is hot, Sicily’s long, hot and dry summers are famous, though the altitude of the vineyards does provide very good diurnal (day time to night time) shifts, with Michele Faro telling me that “even on 35ºC summer days the temperature still falls to 10ºC overnight.” The vast majority of vines are old, unirrigated bush vines known locally as alberello, or ‘little trees’. The dry, fresh conditions also mean that organic viticulture is possible, and many estates I visited say they farm entirely organically, though few were certified. Guiseppe Russo commented that “One of the big challenges for wine growers is to really understand the nature of our volcanic soils.” It seems the very best terroirs are consistently found on really ancient lava, hundreds of thousands of years old, not on the lava from more recent eruptions. He also tells me that there is work going involving geologists, other scientists and agronomists to better understand these unusual soils. The great grape of Etna is Nerello Mascalese, superior in everyone’s opinion to its cousin Nerello Cappuccio, though the two are often blended in simple Etna Rosso. Mascalese produces wines that, depending on the winemaking, can have a lovely Pinot Noir-like delicacy and freshness. For white wines, the Carricante variety is the pride of the region, a high acid grape that reflects the mineral terroir well, though the most widely planted bianco variety in Sicily, Catarratto, features too. Normally less distinguished than Carricante, it is generally used as a blending component on Etna. There are other minor grape varieties, but these are the big four at the heart of the Etna DOC. 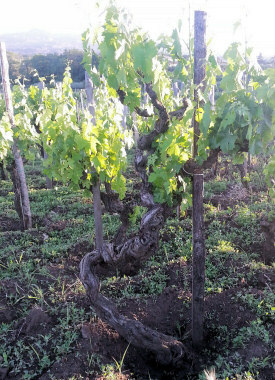 Left: ancient Nerello Mascalese vines growing at Tenuta di Fessina. Red wine dominates, and more than one producer told me that Etna is often referred to locally as “Sicily’s Côte d’Or.” The character of Nerello Mascalese can give beautifully perfumed, rose, tar and truffle-scented wines, light in colour and body, and the echo of red Burgundy is obvious. Others are more reminiscent of Nebbiolo perhaps, and yet other, made with more extraction and body, can be darker, deeper and more chewy. I met up with producer Michele Faro (right) and his winemaker Giuseppe Parlavecchio in their beautifully terraced vineyard close to Passopisciaro in the north of Etna. With lovingly built retaining walls of lava stone, this is their youngest vineyard planted 10 years ago, all with Nerello Mascalese. 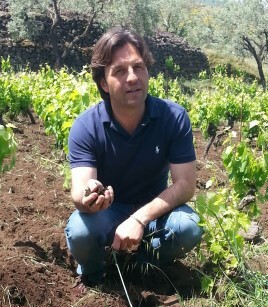 “This is the best territory on Etna for Nerello,” says Michele. “To the east of Etna further south is much better for white varieties.”Although the estate was only established 10 years ago too, Michele’s grandfather was a small producer and grape grower on Etna, and although the family moved into other areas of agriculture, there was a strong desire to “get back to their roots,” with a small, very high quality estate making wine from pre-Phylloxera vines. Even the new vineyard is planted on its own roots, as bush vines, but most of the vines on the farm are between 80 and 120 years old. The vineyards run from 800 to 900 metres, on sandy soils with lots of lava stones and high volcanic minerality. “The luck of being on Etna is the micro climate of each area, the minerality of the soil and the huge diurnal shift in temperature,” says Michele. Indeed the name of the estate – meaning ‘sweet stones’ refers to the lava rocks that are so important. Pietradolce makes five wines, with a total production of just 30,000 bottles. They farm organically (but are not certified), and the old vines giving a yield of just 25 hl/ha – the younger vines are green harvested to reduce the yield to around 35-40. Below, the oldest vineyard at 900 metres. Giuseppe Russo (right) is in charge of this estate today, firmly family-run and focused, his mum still lives above the winery which has a fascinating location. Perched almost on top of the railway tracks, at one time trains used to stop within the winery’s cellars, collect barrels of wine, and run them directly to the Port. At that time the cellar was owned by a group of local growers and operated as a collective, negociant cellar. The farm consists of 15 hectares of vineyards in total, but spread over different areas, the wines bottled as ‘crus’ reflecting their area of production. He has 8ha of old vines planted between 650 and 750 metres, and from the beginning has always micro vinified each vineyard, and in some cases parcels within vineyards, separately. He produces 50,000 thousand bottles, but says “Each harvest is a long process as I want to get to know each parcel, and I pick each at least twice, leaving the best grapes on the vine for longer.” His white wines are made from white varieties scattered in old mixed plantings amongst the reds – he has no dedicated white wine vineyards. 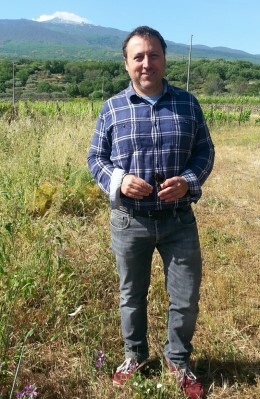 This is one of few estates I visited that is certified as organic, and Guissepe relies on wild yeasts for fermentation. 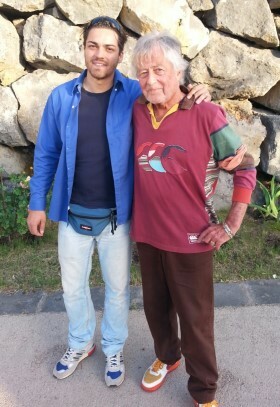 For those obsessed with thrill rides and rollercoasters, may I recommend accompanying Umberto Graci (right) as he wrangles his ancient Landrover up dirt road paths to his highest vineyard at over 1000 metres on the northeast slope of Etna? Battered, bruised, shaken and stirred, you will emerge into a small vision of paradise. This is a land of ancient vines, that struggle to survive on lava soils, baking in summer with scarcely a drop of moisture, and near freezing in winter. “Up here exposition is vital,” Umberto tells me, “otherwise your grapes will never ripen. Plants up here grow more slowly and grapes are much smaller. 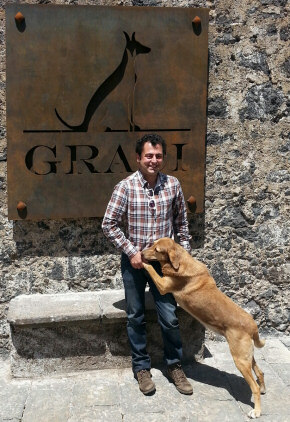 One of our biggest tasks is keeping the grass under control, as it is such a fire risk in summer, the ground is so dry and hot.” In fact Graci is one of only three estates that currently farm above 1000 metres (along with Franchetti and Frank Cornelisson for his ‘Magma’ wine). Around 80% of Etna’s wineries are based here, within a few kilometres of Passopisciaro, though like many others, Graci takes some fruit from the east and southwest too. Their beautiful and historic 1856 cellars were some of the most impressively equipped that I saw, with obviously modern ideas – the latest cement tanks and Bucher basket presses, a range of modern botti and bigger sizes of barrels. Umberto ferments with natural yeasts for the Nerello Mascalese, which always starts fermentation immediately, though he says the white varieties sometimes needs to be started with a selected yeast. 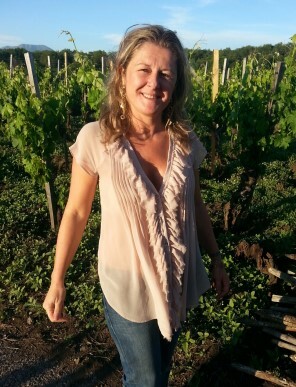 Owner Silvia Maestrelli is as relaxed and welcoming a host as you could hope to meet, taking me on an uplifting evening passeggiata through her vineyards as the shadows lengthened and bathed this beautiful amphitheatre of vines in a flood of umber and gold. Silvia came from here native Tuscany to set up Fessina in 2007. She farms seven hectares, mostly of Nerello Mascalese, with vines that are 70 to 100 years old, though she does have some newer plantings of her own too. The vineyard has some white grape varieties scattered throughout that at one time would have been picked and bottled together with the Nerello, but is now bottled separately, though Silvia also has a vineyard near Milo on the east of the mountain, where they source Carricante, as well as some Nero d’Avola from vineyards near Noto, south of Syracuse. Founded by Guglielmo Cambria and his brother Enzo in the mid-1990s, Cottanera’s impressive operation on the north of Etna has been tinged with tragedy with the early death of Guglielmo. Today, the company is run by Enzo and three of Guglielmo’s children. Pictured right, is Enzo with his nephew Francesco. The family already farmed the land where the vineyards are planted. It was historically vineyard land, but had been replanted to hazelnuts as a strategic business decision at a time when Etna produced only cheap, bulk wines. The family changed it back to vineyard, but initially Enzo says it was “high yielding vines, producing large quantities for the market of medium to low quality. In the 1990s we began to rethink the possibilities for bottling quality wine, which led to wholesale changes.” This was largely led by Italian consumer demand for quality wine, which Enzo says grew considerably during the 1990s, as the price for bulk wine fell. Hence it was another business decision to change their focus. The vineyards were replanted in 1997, with the first vintage of Cottanera in 1999. They planted indigenous varieties, but also Bordeaux varieties and – astonishingly enough – Mondeuse, a rarely seen grape of Savoie in Eastern France, sent by mistake from the nursery, but which they decided to keep (and which was actually very good – see tasting notes below). They also bought two vineyards of Nerello Mascalese and Carricante, which now supply fruit from 35-year-old vines. They now farm 68 hectares of vineyard at around 700 metres elevation, producing 300,000 bottles which makes them one of Etna’s larger estates. Around 40 hectares are indigenous varieties. One fascinating fact that emerged only after my visit on reading Cottanera’s literature is that their entire vineyard team of 25 is female. Had I known, I would have asked why but that is a mystery to be explained another time. The vineyards are not alberello, but cordon spur trained, with dense planting at 5,700 plants per hectare. All wines are made in stainless steel, and reds are aged in both large ‘botti’ and French oak barriques. The first few minutes of my visit to Wiegner’s estate on one of the warmest parts of Etna’s northern slopes was, to say the least, confusing. Peter Wiegner is a mildly eccentric but enormously likeable character, Swiss-born, and now running this small estate with his wife Laura Puccetti and their son Marco, who is the winemaker. Peter set off immediately into the vineyards, switching unpredictably from English to Italian, and refusing to take a breath for even a moment to allow translation. Eventually things settled down and I enjoyed a very enjoyable walking tour of the estate, before returning to the winery for a home-cooked dinner cooked by Laura.